Noel Paton contributed two illustrations for the first edition of 1863. Linley Sambourne provided 100 illustrations to the edition of 1885. 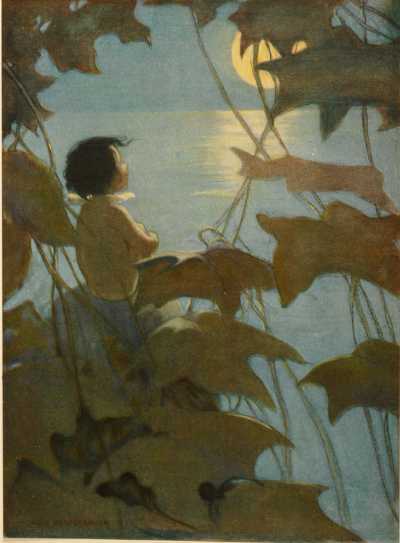 Warwick Goble produced thirty-two tipped-in color plates for the 1909 edition. In 1915, W. Heath Robinson rendered eight color plates and miscellaneous black and white text illustrations to Constable & Company's edition. 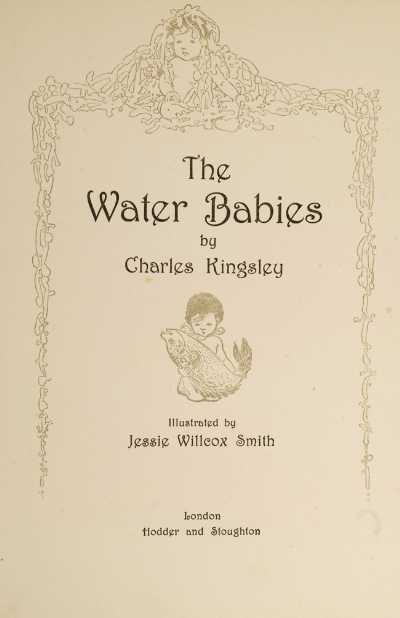 Artists love illustrating Charles Kingsley's The Water-Babies. 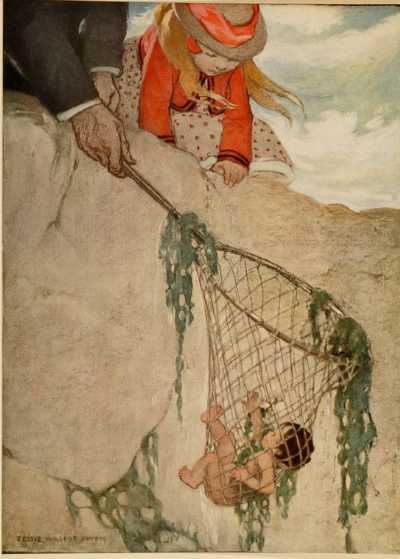 As wonderful as those editions are, however, none are quite as beloved as Hodder and Stoughton's edition of 1916 with twelve gorgeous color plates and green and white text illustrations by Jessie Wilcox Smith. 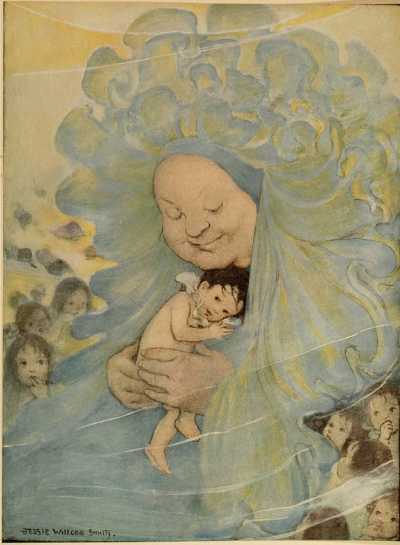 "The large, lavish drawings Jessie Willcox Smith produced as color plates for The Water-Babies in 1916 are among her most loved and admired works. She apparently thought highly of them as well because upon her death in 1935 she bequeathed all twelve to the Cabinet of American Illustration, a special collection of almost four thousand original drawings by the nation's most influential illustrators, preserved within the Prints and Photographs Division [of the Library]" (Library of Congress, Swann Gallery Exhibition). "Cleansed of soot and sin, Tom ultimately finds happiness and spiritual redemption among his fellow aquatic fairies and the natural and supernatural creatures he befriends in his watery world. 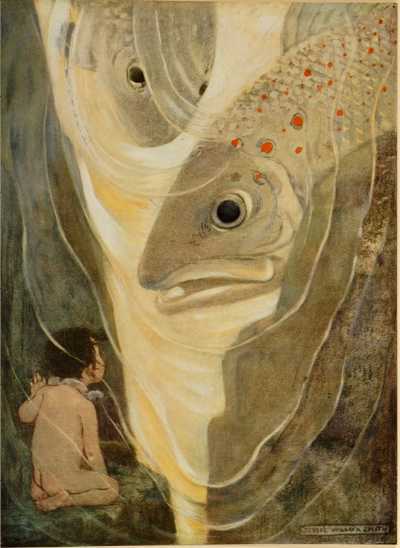 Recognized today as an international classic among children's books, dozens of editions have since been published, though none more beautiful or imaginative than that issued in 1916...with illustrations by Jessie Wilcox Smith. 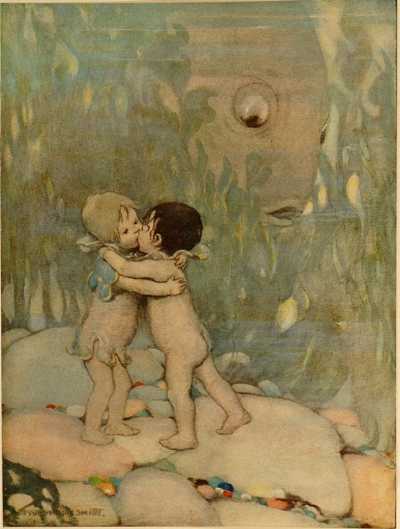 "Jessie Wilcox Smith (1863-1935) was born in Philadelphia the year The Water-Babies was first published. Beginning in 1885 she studied art under the celebrated artist Thomas Eakins at the Pennsylvania Academy of Fine Arts and by 1888 had her first drawing published in a national magazine, St. Nicholas, an illustrated journal devoted to children. She soon found her commercial niche creating images of children and their world for literary publications and advertising campaigns. "In 1894 she enrolled in drawing classes taught by Howard Pyle, perhaps the greatest teacher in the history of American illustration. Under his tutelage, Smith's talents and commissions grew quickly, and by 1900 she was one of the most popular and successful graphic artists in America. Over the course of her long, productive career she created hundreds of covers and illustrations for numerous books and such magazines as Harper's, Collier's, Good Housekeeping, Ladies Home Journal, and Women's Home Companion. In addition, her original paintings and watercolors were widely exhibited" (LOC). In the scarce dust jacket. Rev. 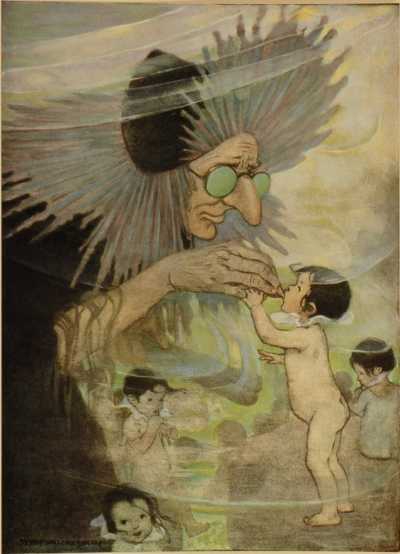 Charles Kingsley was an enthusiastic follower of Charles Darwin and wove allusions to evolution into the story, a didactic moral tale with, alas, cringe-worthy racial references that can spoil the book for modern readers. Biologist Thomas Huxley - "Darwin's bulldog" supporter - is explicitly mentioned in the book, as is Darwin. In 1892, Thomas Huxley's grandson, having read the book and seen Linley Sambourne's illustration of Huxley and colleague Richard Owen inspecting a water-baby in a bottle, wrote to his grandfather. Have you seen a Waterbaby? Did you put it in a bottle? Did it wonder if it could get out? Could I see it some day? – Your loving Julian. I could never make sure about that Water Baby. I have seen Babies in water and Babies in bottles; the Baby in the water was not in a bottle and the Baby in the bottle was not in water. My friend who wrote the story of the Water Baby was a very kind man and very clever. Perhaps he thought I could see as much in the water as he did – There are some people who see a great deal and some who see very little in the same things. When you grow up I dare say you will be one of the great-deal seers, and see things more wonderful than the Water Babies where other folks can see nothing (The Life and Letters of Thomas Henry Huxley, Vol. 3, p. 256). 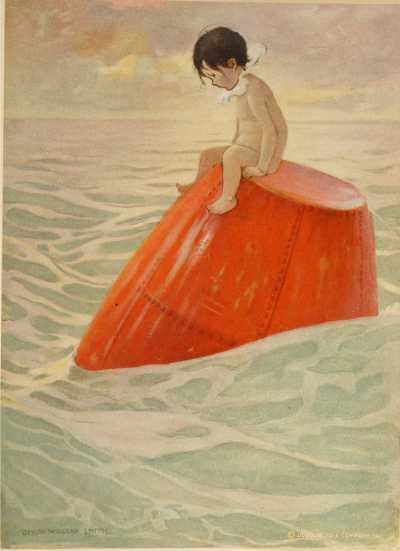 Jessie Wilcox Smith caught The Water-Babies in a bottle bound and printed as a book. 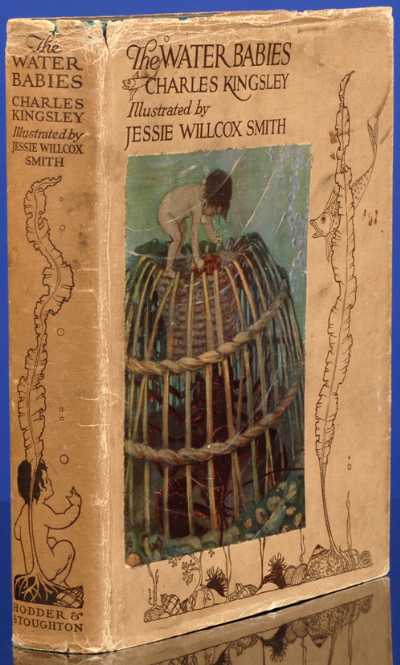 [SMITH, Jessie Willcox, illustrator]. KINGSLEY, Charles. The Water-Babies. 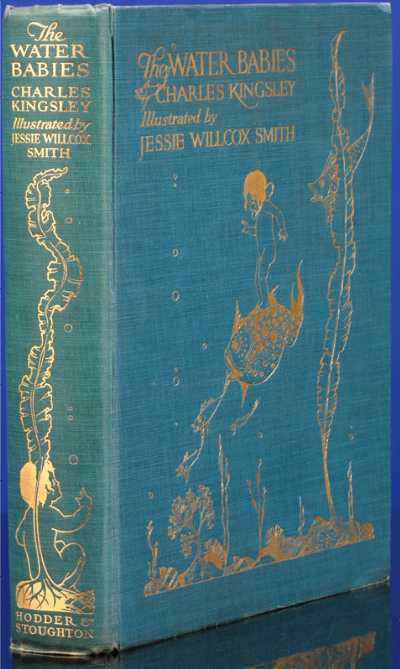 London: Hodder and Stoughton, n.d. .
First U.K. Smith-illustrated edition. Quarto (11 x 8 3/8 in; 278 x 214 mm). ix, , 240 pp. Twelve color plates, with caption guards, including frontispiece. Text illustrations in green and white throughout. Blank endpapers. Publisher's original blue cloth, pictorially stamped in gilt. Dust jacket. Where do you find all these great books?